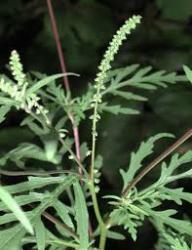 Western Ragweed is usually found on drier soil that contains significant amounts of clay, sand, or gravelly material. This plant is easy to grow, but it can become aggressive in situations that are well-drained and sunny. The flowers are wind-pollinated and rarely attract pollen- or nectar-seeking insects. Caterpillars of moths feed on Western Ragweed. Grasshoppers feed on the foliage and are an important source of food to some insectivorous songbirds and upland gamebirds. The seeds are a popular source of food for many kinds of granivorous songbirds and upland gamebirds. The seeds are nutritious and remain available through the winter months. We grow this plant primarily for restoration projects and do not recommend this for a garden planting. Pollen may be an allergen.